A fine, well-crafted scary novel. 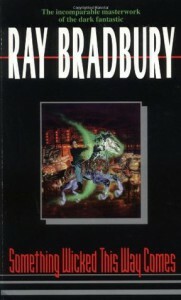 Not as good as Fahrenheit 451, but definitely solidifies Ray Bradbury as an excellent author in my opinion. Terrifying and dripping with atmosphere, Something Wicked is one of the better horror novels I've read. And, as Ray says in his afterword, you can picture each scene playing out as he describes it. I have to go back and watch the movie now.